College can be a life-changing part of anyone’s life. Many college students move out for the first time, start their journey to their careers, and real-life topics that may have not mattered as a kid suddenly start to mean more. There’s a reason why refugee resettlement is such a hot topic around the world. The U.N.’s refugee agency reported in 2016 that 65.3 million people are displaced, which is one for each 113 people and the highest that number has ever been surpassing even the end of World War II. This has sparked political debate in many Western countries where refugees seek refuge, including America, regarding how many refugees should be admitted into the country each year. Kidman happened to be passionate on the subject. He said he doesn’t watch the news much, but something about the stories on refugees and immigration seem to interest him. Kidman isn’t a fan of the low refugee admittance number or recent travel ban from the Trump administration. “I just think it’s funny how America’s origin is pretty much a bunch of white people claiming some land that other people were already living in and now we’re being stingy with it,” Kidman said. While Kidman is unhappy with the current refugee crisis and how America is handling it, that isn’t the case for everyone. Jacob Breinholdt, a sophomore in the University of Utah’s pre-law program, said Trump is making smart moves in the refugee situation. Barack Obama had an overwhelming focus on refugees especially from Syria as an estimated 11 million have fled their homes from a civil war. Donald Trump has cut the number of Syrian refugees that Obama had set by over 80 percent and cut the total number of worldwide refugees allowed in by over half. However, McKenzie Sandler, a student at Salt Lake Community College and volunteer for The Refugee Education Initiative, doesn’t like to dwell on the negatives. Sandler has tutored and mentored students from several countries at The Education Initiative, both online and at the downtown center at 101 S. 200 East. She went there once for a high school class and decided she wanted to do more. In spring of 2018 she will be transferring to the University of Utah’s College of Social Work in hopes to enter a career in a field similar to where she’s been volunteering. Sandler encouraged others to volunteer and if not to at least learn more about the The Education Initiative at the website. While there are certainly dissenting opinions on refugee policy, it can be promising to see young people with an interest in refugees and other real world topics. The University of Utah, in partnership with Salt Lake Community College and Jesuit Worldwide Learning, is working hard to make it feasible for refugees to earn a bachelor’s degree in social work. Jesuit Worldwide Learning Higher Education at the Margins (JWL) is a collaborative global partnership that provides an education to those who are marginalized, including refugees, internally displaced people, economically poor, and socially neglected and underserved. JWL, whose global headquarters is in Geneva, constructs online and in-person learning centers around the world. It offers three levels of educational opportunities, including the Academic or Diploma Program. The online infrastructure allows those in remote villages or in refugee camps, without locally operated schools, to gain an education. Once a refugee finishes with the programs provided by JWL, the student can begin taking online classes from Salt Lake Community College. Students who complete their last 15 credit hours with SLCC can earn an associate degree. The college has agreed to charge refugees in-state tuition. Once an associate degree is earned, the University of Utah hopes to take over from there. Patrick Panos, a professor of social work and director of Global Education and Outreach at the U, is the driving force behind the effort to provide refugees with a chance to earn a bachelor’s degree and become leaders in their respective communities. “Without an education, all you have is your physical labor to sell. And if all you have is your physical labor, that is a time-limited commodity,” he says. JWL laid most of the groundwork for SLCC and the U by setting up a structure for education in distant war-torn areas that the colleges wouldn’t dare enter. Panos says he is grateful for the organization’s work. “They’re going to places where we could not physically go. The University of Utah is not going to go open up a school in Afghanistan. But [the U] can have students in Afghanistan through this process,” he says. Refugees take pride in their education from the University of Utah. Photo courtesy of Karen Cordova. Francis P. Xavier, vice president for academics and research for JWL, said in an email interview that the organization currently has learning centers in the Middle East, Asia and Africa. He hopes JWL will become more global in the future. A trial run proved the functionality of the distance-learning program and the feasibility of providing online classes with little cost to the student. The classes at the U will be offered to student refugees who qualify. That group will become known as a closed cohort, and pay nominal tuition to the College of Social Work rather than to the university as a whole. This is significant because the college will cover the cost of classes so the refugee students don’t have to. “I can charge them a dollar a class, and that‘s OK. And the university is OK with that,” Panos says. Graduates of the University of Utah’s Case Management Certificate Program in 2015. Photo courtesy of Karen Cordova. Distance learning challenges historical notions of how a university operates. Traditionally, students come to campus, where they have access to amenities such as tutoring centers and the library. But an online delivery of course content makes it possible for refugees and others in marginalized communities to pursue educational opportunities. The classes at the U will operate through Canvas, an online learning platform that connects professors and students in real time. A library database can be accessed with a student ID, so refugee students are able to access scholarly articles at their fingertips. Kyle Jensen, director of Canvas user interface, said in an email interview that Canvas is special in terms of communication. Students within the Canvas classroom have much to gain from this collaboration and cultural exchange, both of which are crucial to the nature of social work. This relationship is valuable, as it allows traditional students to gain other perspectives before entering their profession. Panos pointed out that refugees who are trained in social work are then able to use this knowledge to work within their respective communities to improve the lives of the people living in the camps. “Social workers learn how to advocate, how to do community development, how to do all of the things about how to reconstitute a community — and bring mental health in, child welfare in, and all those different pieces,” Panos says. Refugee students speak in the native dialect of fellow asylum seekers, and have intimate knowledge of what is needed in the places where they work. Because of this insight, graduates of the College of Social Work can later seek employment with International relief efforts such as Doctors Without Borders and the United Nations. Panos has high hopes for the future of the program. He’d like to see it expand beyond the College of Social Work, so students can earn other degrees in fields such as nursing, architecture and education. Panos also said his wish is for more refugees to have access to higher education, made possible by a collaboration of efforts from universities and programs in the U.S.
Xavier, the JWL executive, said his organization currently offers a diploma and some associate degrees. It wants to offer bachelors and master’s degrees and eventually doctoral degrees. “I look forward [to] JWL becoming a virtual university which offers degrees of high quality for the refugees and the marginalized at affordable cost,” Xavier says. Journalism is a changing world because of the fairly new popular concept of multimedia journalism. So what is the difference between journalism and multimedia journalism? “The term ‘media’ blends (and blurs) concepts of culture and technology. When uses as a synonym for journalism, the term ‘media’ pushes technology into the foreground and conceals the fact that ‘journalism’ is one thing and ‘media’ is another,” said G. Stuart Adam of Poynter.org. Multimedia journalism blends news with different mediums such as “video, photos, graphics, social media, reporting, writing, and ethics” said Jennifer Napier-Pearce, host of The Salt Lake Tribune’s daily web show Trib Talk. Napier-Pearce said that the most important elements in multimedia journalism are reporting, writing, and ethics. Those three things are what journalism is all about, and journalism is the element that cannot be forgotten. Multimedia journalism is just a different way of presenting or telling a story, Napier-Pearce said. Napier-Pearce describes what she thinks drives this multimedia journalism as digital. “Digital equals possibilities. Because of the digital environment we have grown up in, we have expectations,” she said. The audience who is receiving the news has growing expectations because of all the new possibilities the digital world provides in the multimedia journalism world. Because of these new possibilities with digital mediums, if makes journalism very competitive. “Everybody is fighting for your eyeballs and your money,” said Napier-Pearce. Sherwin Coelho, from The Guardian, shared his experience about being a multimedia journalism student. “If I had to do my course (MA multimedia journalism) all over again I would have made sure I learnt shorthand, HTML, InDesign, DreamWeaver, creating infographics and data journalism — or at least the basics of each,” Coelho said. Napier-Pearce said she learns new things all the time. Multimedia mediums are an ongoing change. There are a few factors that have changed about multimedia journalism. Napier-Pearce said she has noticed that this type of journalism is changing by the length of the stories, videos, and deadlines. People are expecting news faster, which means shorter deadline to produce news. People don’t want to read a 30-inch long story anymore. The same goes for videos — people are looking for short videos that get them the most important information the fastest. The Salt Lake Tribune has been experimenting with this for a while, Napier-Pearce said. The Tribune is looking for ways to make Trib Talk shorter. Overall, Pearce’s biggest challenge of the new multimedia journalism is trying to hold people’s attention. University of Utah Student and former Youthlinc participant, Jacob Draper, who has completed two humanitarian trips, Draper said he wanted to become involved in humanitarian work so he could help others. However Youthlinc, A Utah-based Humanitarian group, that’s headquartered in Salt Lake City, organization’s mission statement is to “create lifetime humanitarians” not just to send people off on a trip and never expect them to do service again. Youthlinc started as a small group but grew to have hundreds of service students traveling each year to Madagascar, Cambodia, Guatemala, Kenya, Peru, Thailand and Nepal. Each member of the teams are required to apply for Youthlinc, be accepted and attend mandatory monthly meetings during the school year, and complete 80 hours of local service before they embark on their international service trip. Forty of the 80 hours have to be performed at the same location, and 40 of the service hours can be miscellaneous service. Construction Committee- all Youthlinc team members are a part of this committee and each location has different projects. Community Health Committee- this committee teaches health lessons and donates medical supplies to the service site. Business Development Committee- teaches basic business and helps create a small business that will benefit the community. Draper shared his favorite service projects the team did while he was a part of the Thailand June 2014 team and Nepal 2015 team. Draper said he plans on going on another humanitarian trip with Youthlinc in the future. Abi Scoma, a former Youthlinc participant and assistant team leader, in a recent email interview shared why Youthlinc is important to her. Youthlinc offers a Young Humanitarian scholarship every year to a student who has shown and developed humanitarian attributes, and who has made a difference in their community. These scholarship applications are reviewed and narrowed down to a recipient of the scholarship. 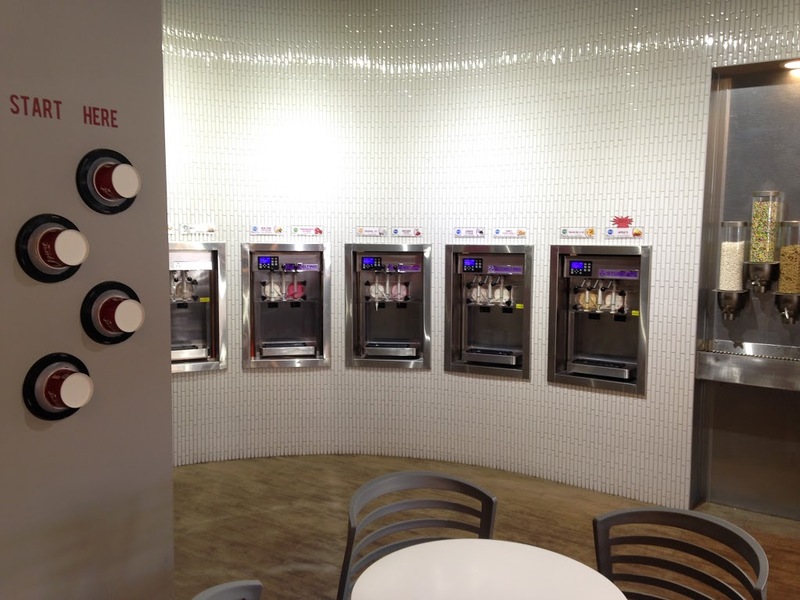 Sam Webster, a University of Utah graduate in Information Systems, wasn’t planning on opening a frozen yogurt business the day of his graduation. The idea of Ugurt was inspired by the lack of dessert joints around the U. Brothers Sam and Adam Webster wanted to celebrate Sam’s graduation with their family, but were unable to find a place that served desserts. While driving past The Pie Pizzeria at the bottom of campus, the Webster brothers saw the old Utah Textbook Exchange building was vacant and available for a new lease. That moment, the two rookie business owners came up with the name, “UGURT.” The Websters didn’t want to open a franchise yogurt shop because they wanted to market their brand freely. Since the location is so close to the U, it offers a closer association with the university and the students. Customers take their cup and begin filling it with yogurts and toppings as they make their way through the line. Neither of the brothers had previous experience in running a business. In fact, Adam is a student at the U, working toward his masters in International Studies. Being new to the small-business world didn’t deter them from opening Ugurt in October 2013. The entire family pitched in to help get the business up and running. The Websters work hard to create a great environment for their customers and employees alike. While providing flexible work hours and a solid payroll, they aim to hire students because they want to cater to all aspects of the college life. The Websters understand what it’s like to be a working college student, so providing a job that is located on campus is quite convenient. Kassidy Samuels, an employee at Ugurt, agrees that it is a great business to be involved in. Most of Ugurt’s success originates from the owners’ passion to provide the best experience possible for their customers. Ugurt can easily cater to students’ needs because it is open until midnight and offers free Wi-Fi. This gives plenty of options for students, whether it is a place to host late-night study sessions, socialize with friends or satisfy those late-night munchies. Ugurt’s menu lists many different options other than frozen yogurt treats. Compared to franchises, local businesses do not have that automatic public awareness of the new products, which can make starting a brand-new business really difficult. Marketing wise, the Websters believed it would be a good idea to incorporate as many local events into their business as possible, such as weddings, banquets and school and sporting events. Social media’s role in advertising and promoting has led to improved interaction with their customers and the University of Utah student body as well. The environment of Ugurt alone has brought in a lot of customers, but their new promotions continue to bring in new people every week. All thanks to the Websters’ new promotion of “Light the U.” This season, customers get buy-one-get-one-free on cups of frozen yogurt every time the Utes basketball and gymnastics teams win. It has benefitted Ugurt because it encourages customers to come in and buy their product even during the wintertime when frozen desserts aren’t as appealing. Ugurt attracts its customers with a wide range of yogurt flavors, toppings and gourmet hot beverages. The frozen yogurt flavors rarely change, which is why cookies ‘n’ cream, raspberry/pomegranate, peanut butter and cake batter tend to be the most popular. With the variety of flavors and toppings, Ugurt gives customers freedom to choose. At 49 cents an ounce, chocolate addicts and fruit fanatics can fill their cup however they want. 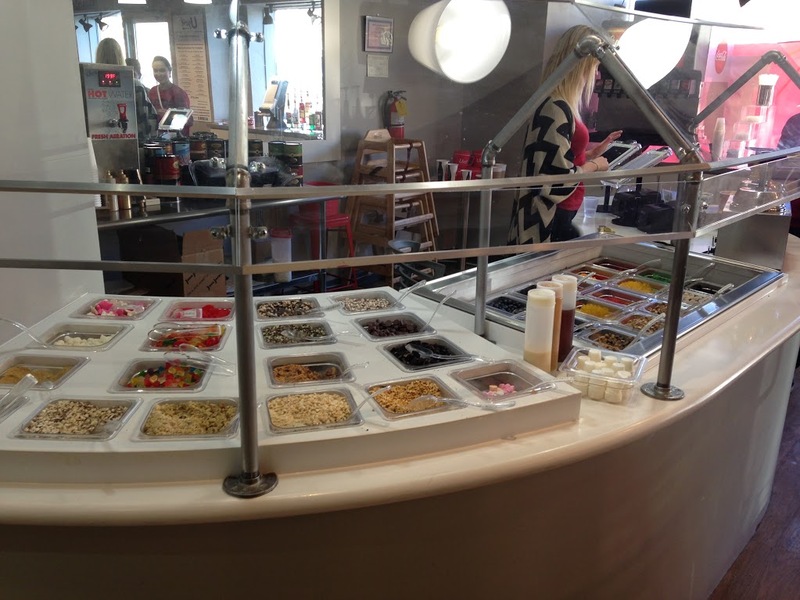 The display of toppings allows customers to choose however much they want and whatever they want. The owners purchase their frozen yogurt and most of their toppings from U.S. Foods and their fresh fruit from local markets. The hot chocolate is bought locally from Stephen’s Gourmet Hot Cocoa. 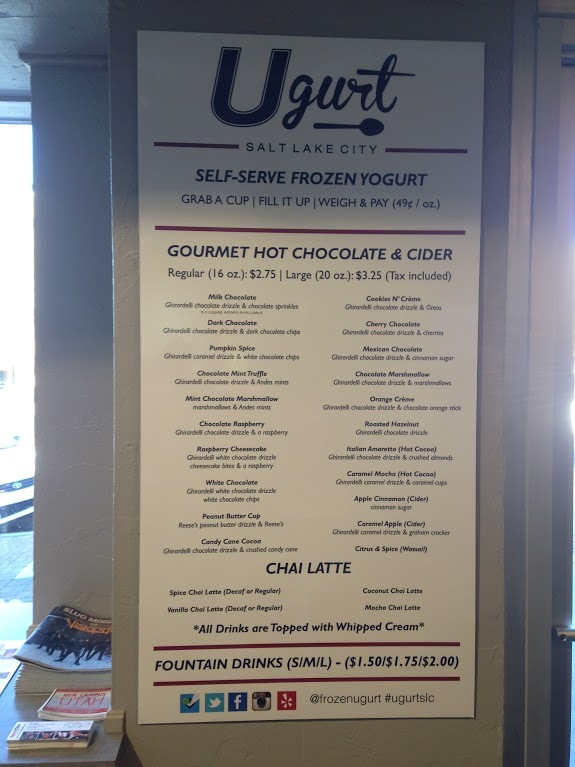 Their hot chocolate bar adds a nice twist to the Ugurt menu, and is a clever way to keep business steady during the winter. The Webster family hopes to expand their company to other areas in the near future. Even without business degrees, Adam and Sam Webster are successfully running Ugurt and just took over management of the Hokulia Hawaiian Shaved Ice franchise in Utah. After sustaining a spinal cord injury, it’s hard to get back into life as it was before. But, a program in Salt Lake City called TRAILS can help those individuals become involved in recreational sports. 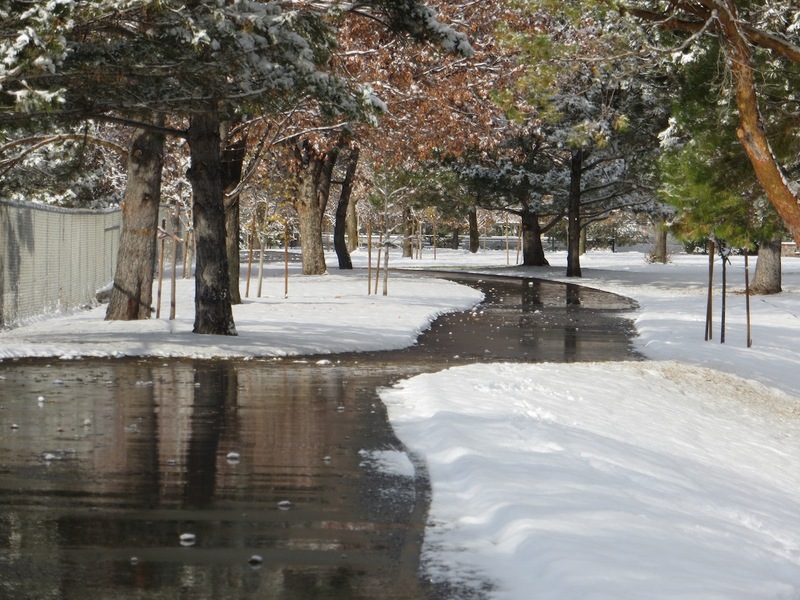 Sugar House Park is an area where TRAILS participate in preparing for races and other events. Photo by Natalie Christensen. TRAILS (Therapeutic Recreation & Independent Lifestyle) helps anyone with a spinal cord injury get out and be active in outdoor recreational sports like skiing, hiking, kayaking and more. The main goal of this program is to help people not just physically, but also spiritually and mentally by keeping a tight community of people affected with spinal injuries. TRAILS is housed in the University Hospital, which provides most of its funding. Medical residents as well as trained volunteers assist with the program by helping participants in the outdoor activities. Wally Lee has been involved with the program for five years and has really enjoyed it and what it has to offer. Lee explained that getting any equipment to do anything with a spinal cord injury makes it hard to do recreational sports and is very expensive. But now that he has access to the equipment he is able to participate in activities he used to do before he became paralyzed. Because of TRAILS Lee has been able to do recreational activities with not only other participants, but also with his family again. Lee is now teaching others with spinal cord injuries how to play wheelchair tennis, and do sit skiing as well as other sports. TRAILS coordinator Tanja Kari had her arm amputated at birth. She has always been an active athlete, and has been involved with sports for people with disabilities her whole life. She was also a gold medalist in cross country skiing in the 2003 Paralympics. However, she agrees that TRAILS has been a highlight. Kari and Jeffrey Rosenbluth M.D., assistant chief of the Department of Physical Medicine and Rehabilitation at University Hospital, started the program in 2006. Rosenbluth, who specializes in spinal cord injuries, had envisioned this program even before Kari came along. But with a professional in the medical field and an athlete who has been involved with sports for people with disabilities, TRAILS has become a success. Kari explained that many people who sustain a spinal cord injury don’t usually want to be involved in sports, but when they join TRAILS their attitude changes and they end up loving this new way to participate in recreational sports. Participants don’t have to be a patient at the University Hospital. It is open to anyone with a spinal injury. People who are interested in volunteerting with TRAILS don’t have to be a nurse or a professional. Volunteers will be trained in how the equipment works and how they can help the participants with spinal injuries get back into activities that they were once involved in, or try a new sport they didn’t know about.